Meat products produced by DiRusso’s Sausage, Inc. are produced under the United States Department of Agriculture Grant of Inspection. (Level 2: Certified HACCP Based Food Safety Plans). All products are guaranteed on the date of shipment to be produced and labeled according to the rules and regulations of the Meat Inspection Act. In addition to meeting all the requirements of the Food Safety Inspection Service (FSIS) division of USDA, DiRusso’s assures that a validated temperature is maintained at safe limits at all times. DiRusso’s uses only raw materials produced by other USDA inspected facilities. 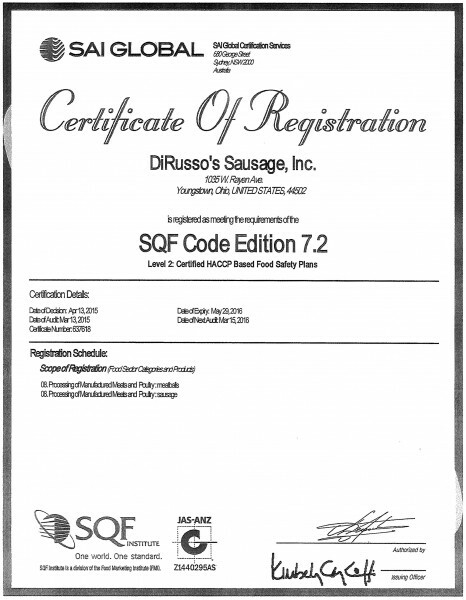 DiRusso’s Sausage, Inc. will exercise due vigilance and adopt all measures to assure the safety and quality of the quality of the products we market.